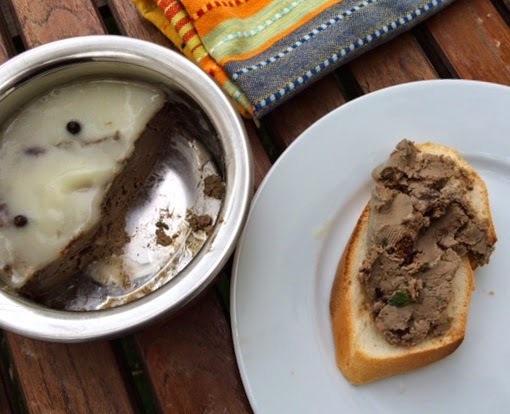 Tender - just pink - chicken livers, red wine, cognac and sweet dried black mission figs are blended to make a delicious terrine. 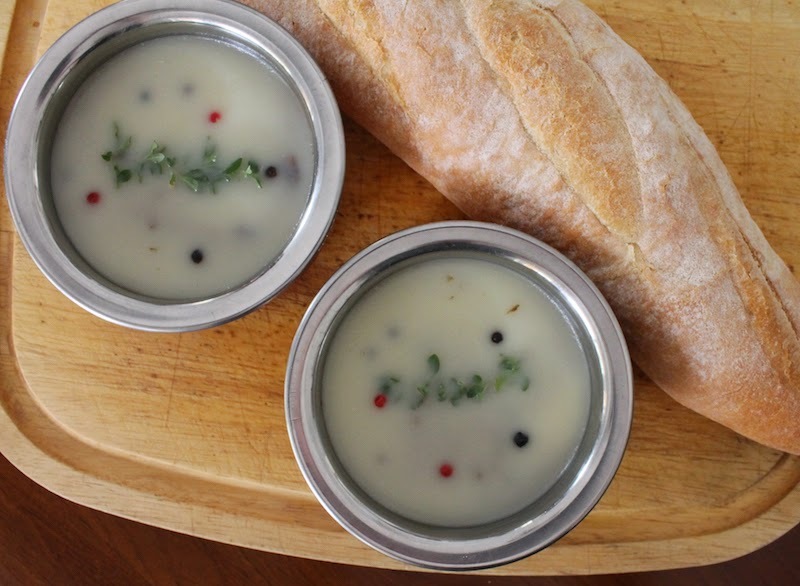 Serve it with sliced baguette, toast or crackers. Just because a get-together is meant to celebrate a football game or another sporting event, that doesn’t mean you can’t add a little sophistication to the menu. 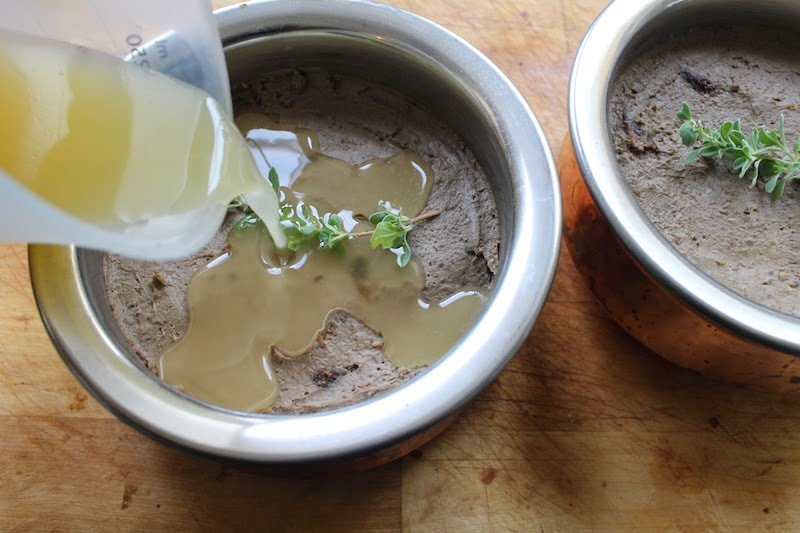 These little pots of chicken liver terrine (although, dear God, don’t call it that if you are feeding a picky crowd!) would be the perfect addition to your party table. They can be made a couple of days ahead. Keep them well chilled and covered with a thin layer of melted butter or even duck fat, if you have some on hand. I married a sports buff who was raised playing football (but in his case, read: soccer) but he also enjoys golf, tennis and American football. Even his very English father indulged, watching college and pro football while living in Freeport, Bahamas. I’ve already told the story of how I met the in-laws, so I’ll just say that finding out that my father-in-law enjoyed watching American football was another large surprise. I figured him for a cricket man with his posh English accent. But I can tell you this, he would have loved this terrine, no matter what the sport it accompanied. And his son is also a big fan. 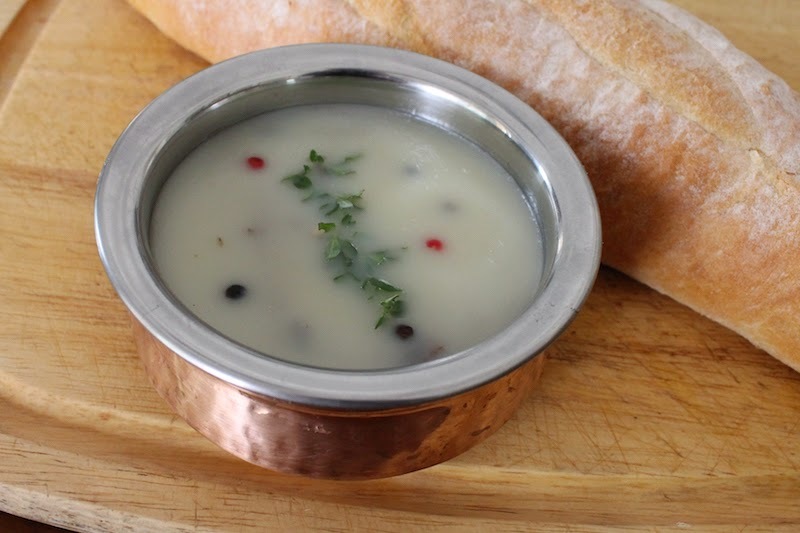 1/4 – 1/3 cup or 60-75g melted butter or duck fat ,depending on the width of your bowls. 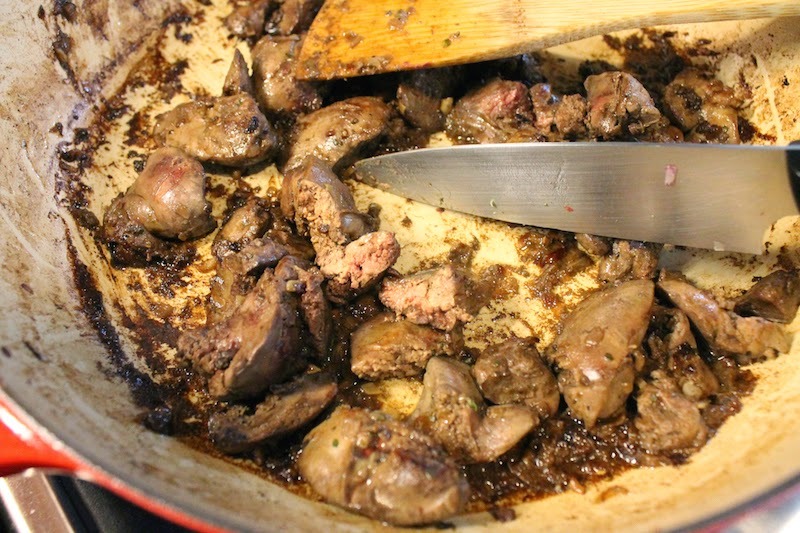 Clean the chicken livers by pulling of any gristle or fat with a sharp knife and rinse them with cold water in a colander. Allow to drain well. 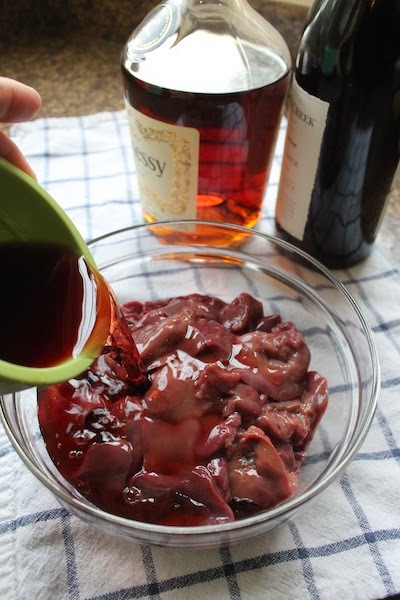 Put the livers in a bowl and add in the wine and cognac. Stir well and cover with cling film. Leave to marinate for 2-3 hours in the refrigerator. Meanwhile mince your onion and garlic and set aside. 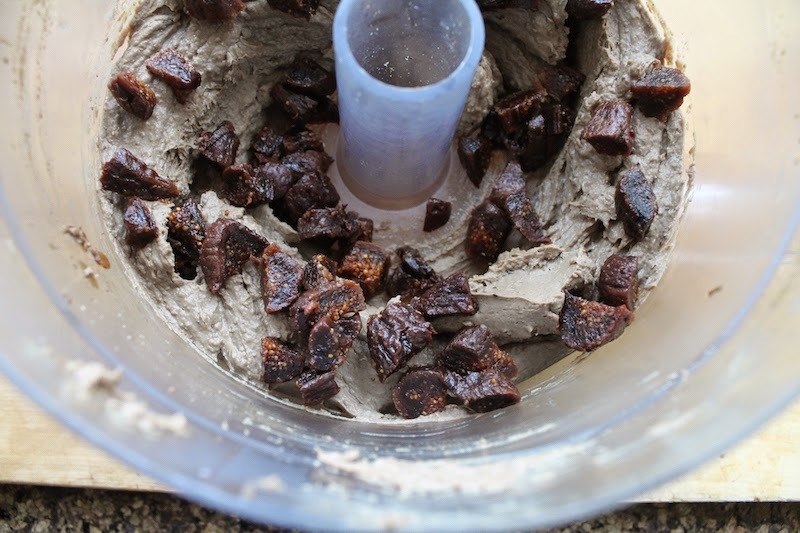 Cut the stems off of your dried mission figs and soak them in hot water for about 30 minutes. Pull the leaves off of your thyme and mince them. 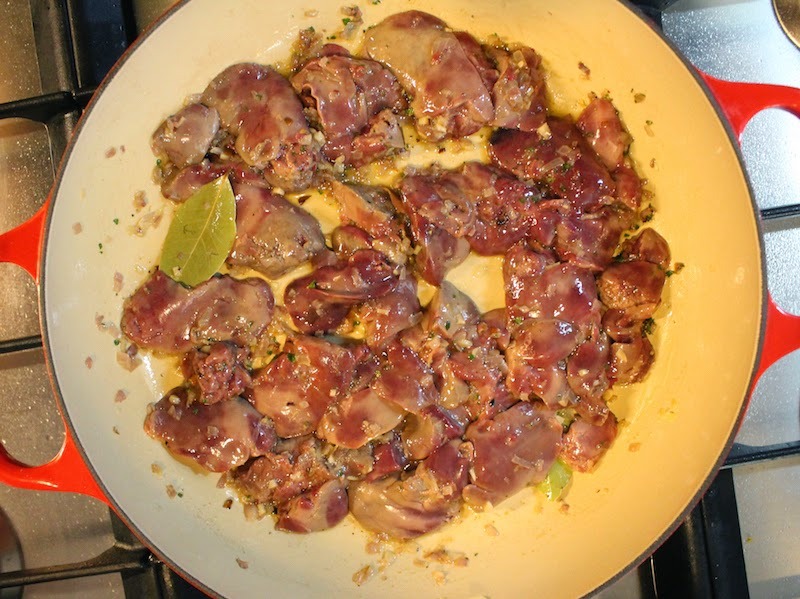 Once the marinading time is up, drain the livers but save the marinade. 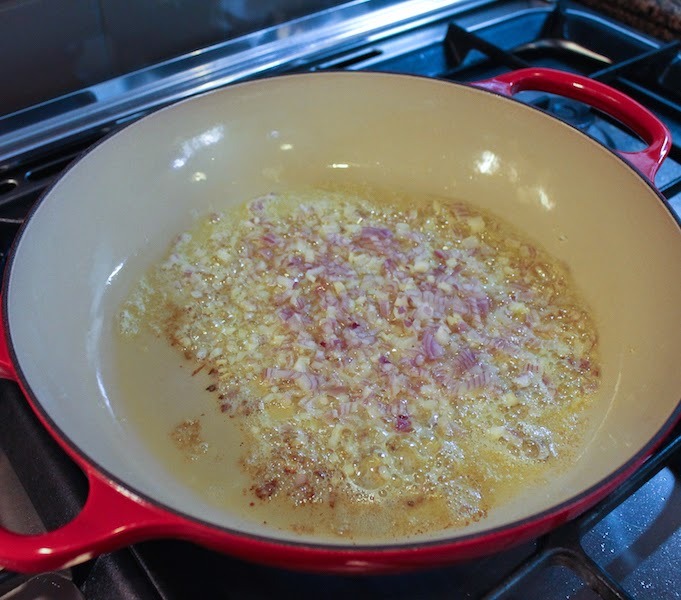 Put a healthy drizzle of olive oil in your pan and sauté the onion and garlic until they are translucent. 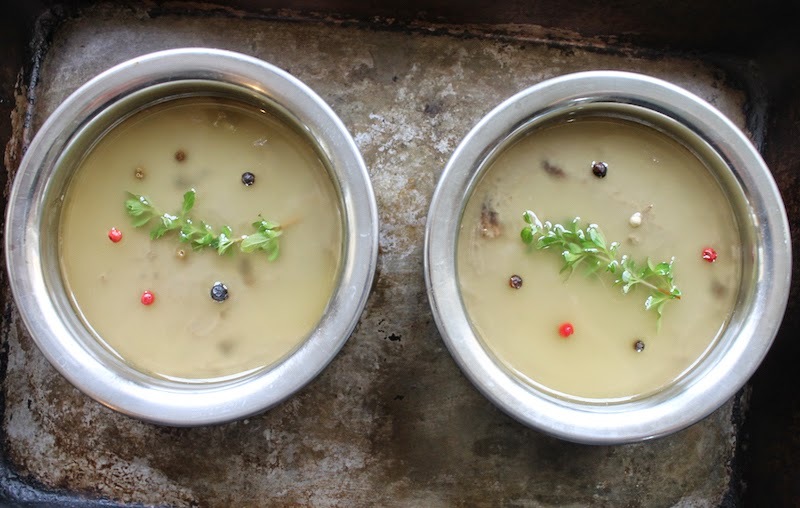 Add in the drained livers, thyme and bay leaves. 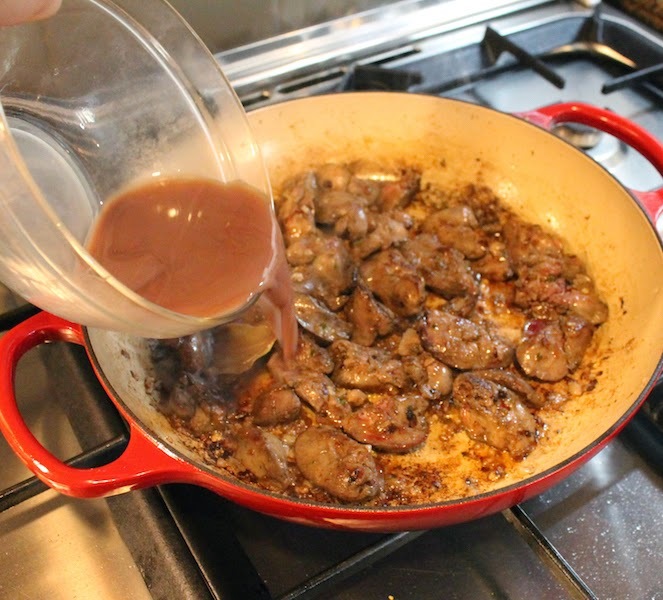 Cook over high heat for just a few minutes, browning the outsides of the liver. Add in the wine/cognac marinade that you saved. Cook for a few more minutes, until the liquid has evaporated. The insides of your liver should still be ever so slightly pink. 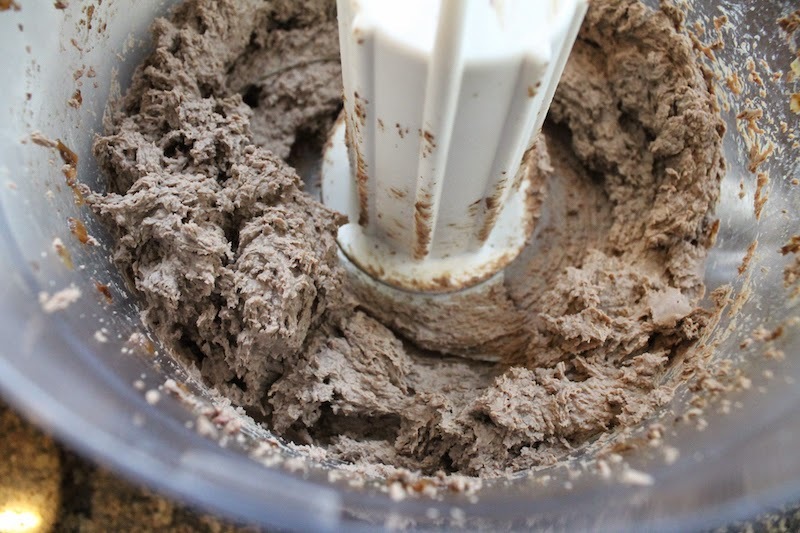 Tip everything into a food processor and process until smooth, using a rubber spatula to clean down the sides occasionally. Cut your chilled butter into small cubes and add them to the liver. Process to blend. When you have a smooth paste, add in the figs and processor briefly. You want them well mixed in but with small chunks still visible. Tip the mixture into your serving vessels and smooth the top. I chose two smaller bowls because I was transporting them to another city by car, but you can put it all into one larger vessel, if desired. Put one small sprig of thyme on top for decoration. 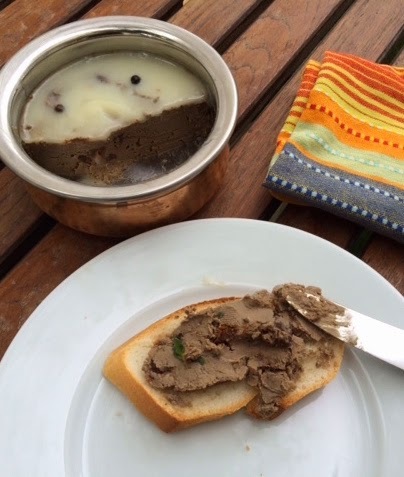 Melt your butter or duck fat and pour it carefully on top of the terrine to keep it from drying out and turning dark. Sprinkle on a few whole peppercorns, if desired. And no matter which your team or tournament, may your favorite win! Sweet ripe bananas and soft cream cheese combine to make the best muffins! Add in a goodly number of toasted pecans and these are the perfect breakfast or snack. If you’ve ever had a look at my blog roll in the left hand column (assuming you aren’t on a mobile device, and then I don’t know where it goes!) you’ve likely noticed one link called Kelli’s Kitchen. That’s my friend, Kelli’s blog. She was blessed with a grandmother who loved to cook and bake and who was delighted to have little hands helping her in the kitchen as she concocted her culinary magic. Kelli often shares her Nana’s best-loved recipes but just last week, she published one for an Old-Fashioned Cream Cheese Banana Nut Bread that she adapted from Southern Living Magazine. I love that Southern Living tried to make the banana nut bread healthier, using some whole wheat and reduced fat cream cheese, but Kelli did Kelli and made it more delicious. Even as I read her post, I knew that I would have to recreate that old-fashioned banana bread in muffin form. Those sweet bananas and cream cheese may sounds like an unusual combination, but let me assure you that they are divine together. This may be my favorite sweet muffin so far in all my years of Muffin Monday. Preheat oven to 350°F or 180°C. Fill the muffin pan with liners or grease it really well with butter or non-stick spray. In case you are coveting them, my pretty liners were a gift from my elder daughter. They came from Crate & Barrel. Measure your flour, sugar, baking powder, baking soda and salt into a large mixing bowl and give them a good stir to mix. In a medium-sized mixing bowl, mash your bananas and softened cream cheese together with fork. Add in the egg, butter, milk and vanilla and mix well. Complete the batter by pouring the liquid ingredients into the dry ones and fold until they are just combined. You should still see a lot of dry flour. Chop your pecans roughly and put aside a generous handful for topping. Fold the rest of the pecans into the batter. Divide the batter evenly between the muffin cups. Sprinkle the tops with the reserved chopped pecans. Bake in the preheated oven about 20-25 minutes or until a toothpick comes out clean. Allow to cool for a few minutes in the muffin pan and then remove to a rack to cool completely. 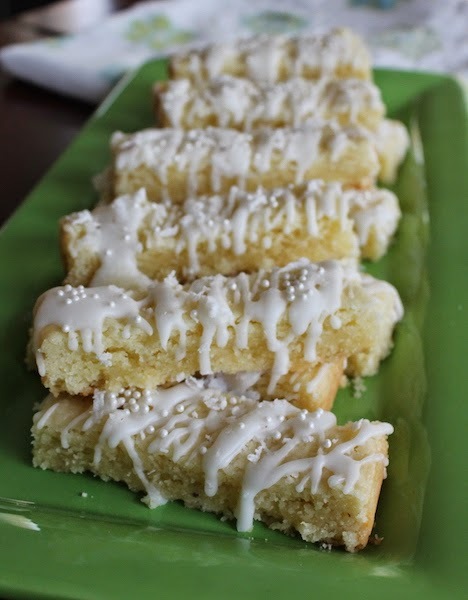 These buttery shortbread cookies are flavored with fresh grated coconut and golden rum, then drizzled with rum glaze and more coconut. When the wind is whipping around you and it’s cold as cold can be outside, pour yourself a cup of steaming hot tea and bite into this luxuriously rich cookie. This month’s Creative Cookie Exchange theme is Comfort Cookies and we were supposed to create a favorite cookie for someone in our lives. But this week I am feeling especially generous since my mom and mother-in-law arrive on Thursday to help me celebrate my own birthday on Friday. So this cookie is for ALL of you in the North Hemisphere who might be experiencing freezing temperatures and unpleasantly moist conditions. As the rich shortbread crumbles between your chattering teeth, the rum and coconut should evoke a beach vacation where you can imagine cabana boys serving fruity drinks under palm trees swaying gently in the tropical breeze, with the warm sunshine working its way to your chilled bones. If you want to add a tot of rum to your hot lemon tea to go along with, no one will judge you. This recipe is adapted from one on The Café Sucré Farine. Preheat your oven to 325°F or °C and prepare your 8x8in or 20x20cm baking pan by lining it with parchment paper. 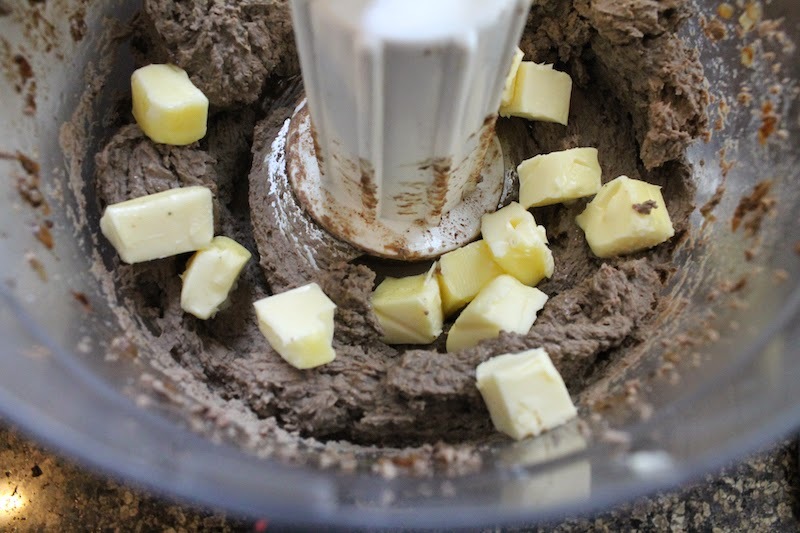 In the bowl of your stand mixer or with handheld beaters, beat the butter briefly until it is smooth, then add the powdered sugar and beat again for about one minute. Add in the flour, cornstarch, coconut, rum and salt and beat until just mixed. Yay! I remembered the flour this time! Tip the dough into your prepared pan and cover it with cling film. 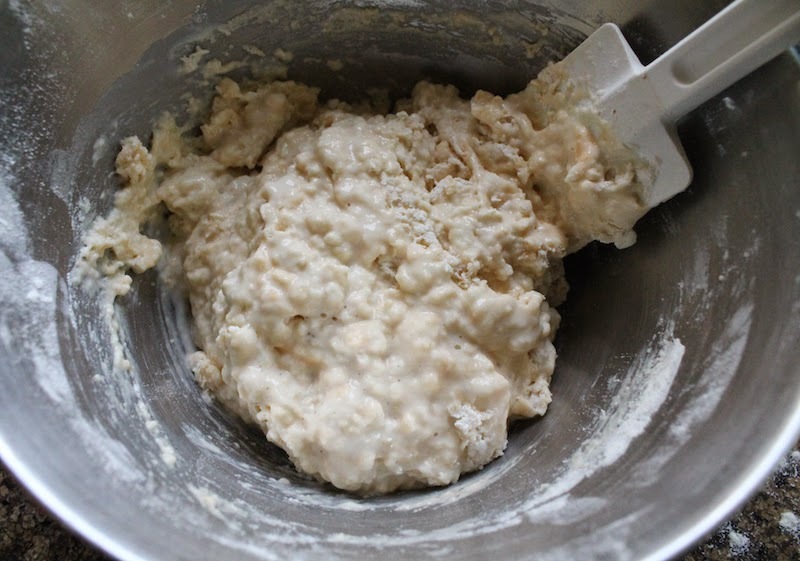 Use your hands to spread out the dough evenly in the pan, making sure to get all the way into the corners. Remove the cling film and draw lines on the dough with a sharp knife where you plan to cut the cookies apart. Bake in your preheated oven about 18-22 minutes or until lightly golden on the sides but still pale on top. Remove from the oven and allow to cool for about 10 minutes. Transfer the parchment with cookies to a cutting board and carefully cut them apart while still warm, using a very large knife that will let you cut the whole way, or almost the whole way across, with one downward motion. These cookies, like all shortbread, are crumbly so you don’t want to break them while sawing at them. Make the glaze by mixing the powdered sugar and rum with the pinch of salt. Add the milk a little at a time, stirring well between, until you get a good dripping consistency, then stop. You may not need all the milk. Once the cookies are cool, separate them slightly on the parchment paper and drizzle the glaze back and forth over them till it’s all used. Sprinkle them immediately with a little extra grated coconut and a couple of teaspoons of shiny decorations, if desired. Allow the glaze to set before trying to move them or stack them. Do you need some comfort cookies? We've got something for everyone and even one for Man's Best Friend! Who would you bake a comfort cookie for? Creative Cookie Exchange is a great group of bloggers who love to bake cookies. We get together once a month (the first Tuesday after the 15th of each month) to post cookie recipes with a common theme or ingredient. You can also just use us as a great resource for cookie recipes--be sure to check out our Pinterest Board and our monthly posts (you can find all of them here at The Spiced Life). 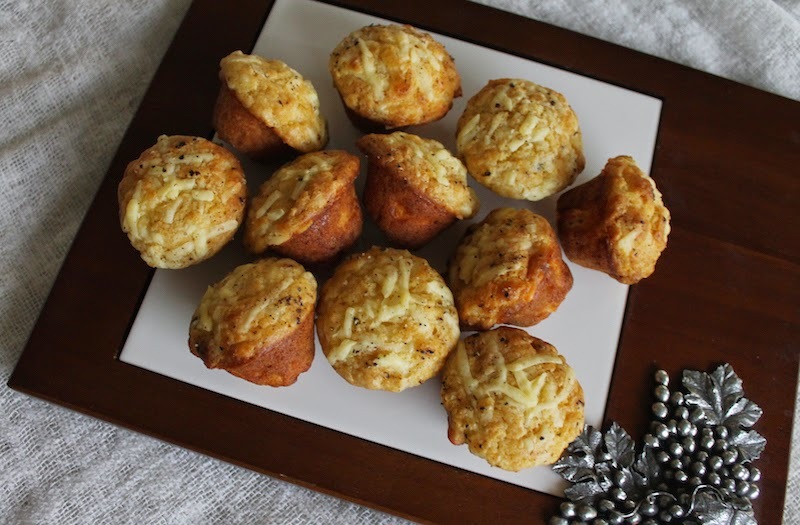 Mini muffins are the perfect small snack, especially when they are made with extra bitey cheddar cheese, buttermilk and a good sprinkling of freshly ground black pepper. I had a baking failure today. No, not these lovely little muffins. They are a breeze to slap together and bake up golden, with crunchy outsides and more-ish insides. I could have eaten all 12 singlehandedly, so I made myself quit at one and I brought them along to share with my Bible study ladies. Where I proceeded to eat two more. 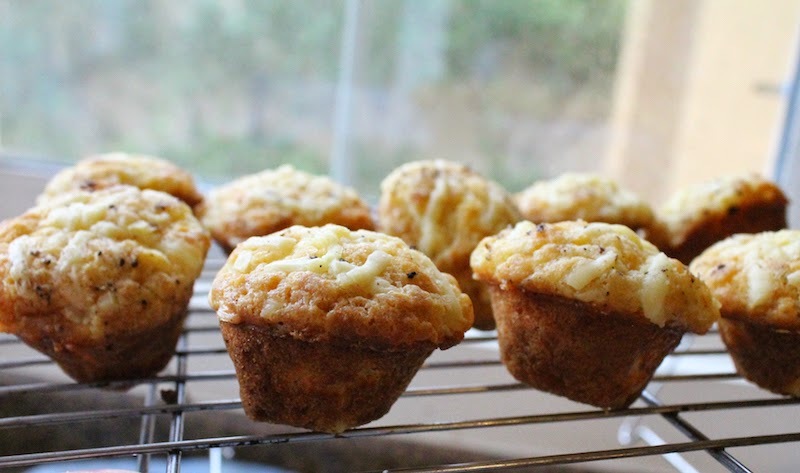 Cheesy muffins are one of my weaknesses. The major failure was the coconut rum shortbread cookies I’ll be sharing tomorrow. I creamed the butter, add the powdered sugar and then the rest of the ingredients. Spread the dough out and popped the pan into the oven, smugly thinking to myself, “with time to spare!” I set the timer for 12 minutes initially and checked on the shortbread when the bell rang. It was bubbling! I mean seriously, truly, like I had made caramel in the baking pan or something, bubbling. And that is what you get when you bake a cup of butter with powdered sugar, some coconut and a little cornstarch. A viscous mess that will never, ever become cookies. I forgot the flour. Totally user error. Man, I hate when I do that! And that is my excuse for eating three cheesy muffins. Consolation. You find your own excuse. 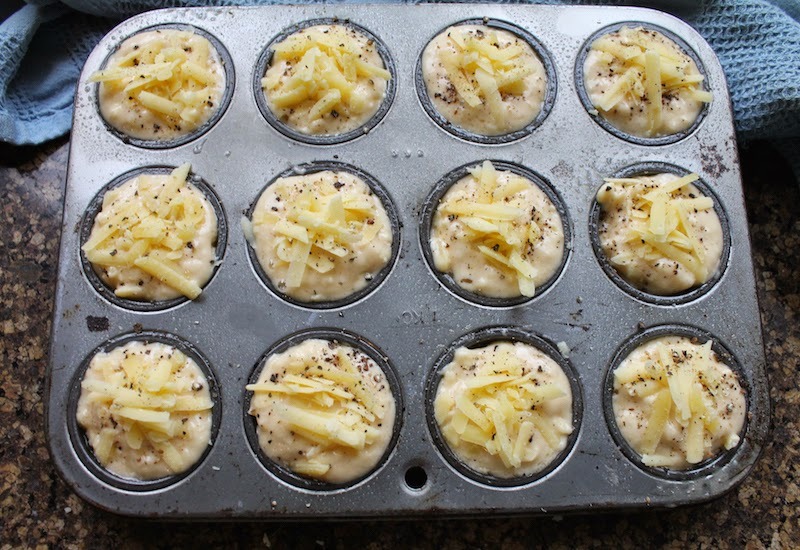 Preheat your oven to 350°F or 180°C and liberally grease your 12-cup mini muffin pan. You could probably stretch this batter to 18 mini muffins if you fill the cups three-quarters full. Grate your cheddar, if it’s not already grated. 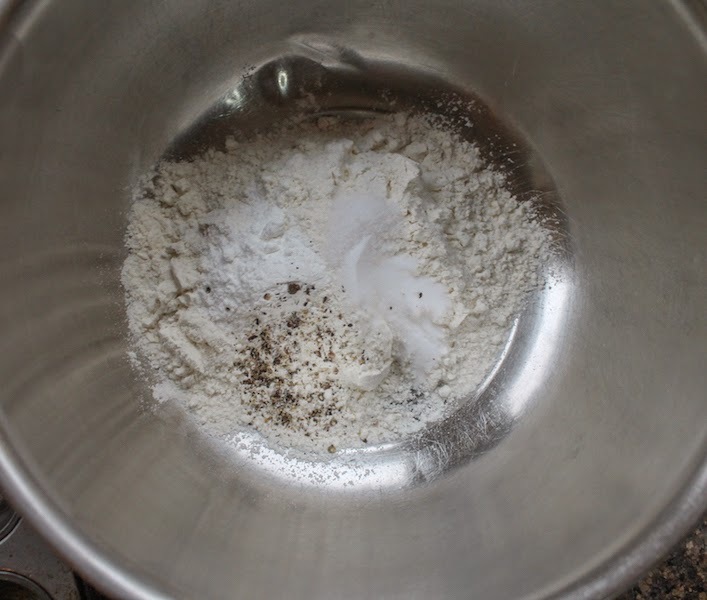 In a large mixing bowl, combine your flour, baking powder, baking soda, salt, and a few generous grinds of black pepper. 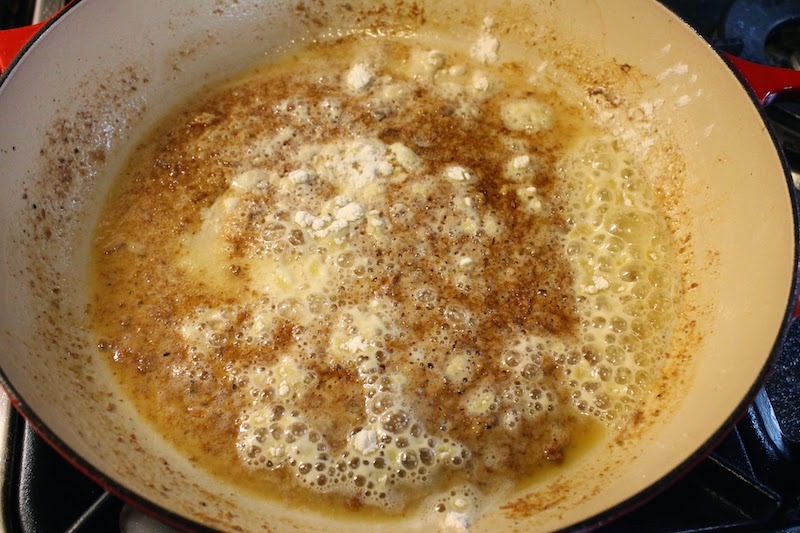 In a smaller mixing bowl, whisk together your egg, buttermilk and oil. Pour your liquids into the dry ingredients and stir until just mixed. Now fold in all but a handful of the grated sharp cheddar. Divide the batter between the prepared cups in the muffin pan. Top the batter with the reserved grated cheddar. Give each one another good grind of black pepper. 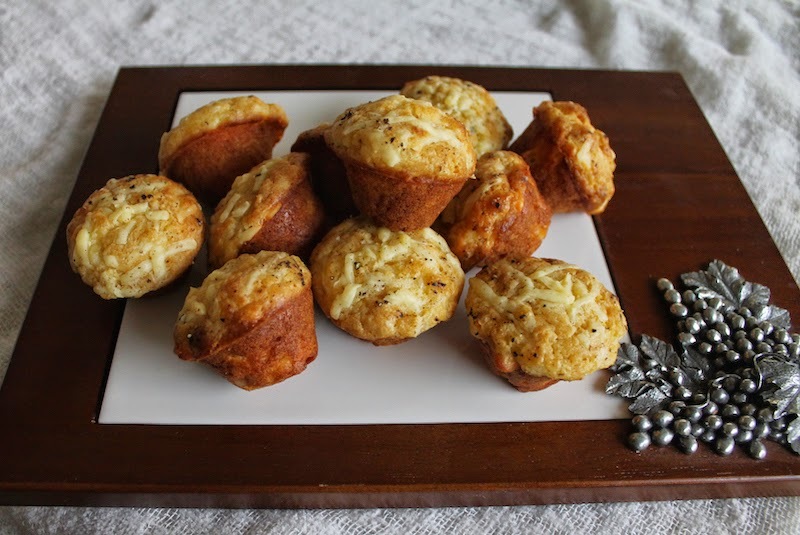 Bake in your preheated oven for 15-20 minutes or until the muffins are lovely and golden. Allow to cool in the pan for a few minutes then remove to a wire rack to continue cooling. These are fabulous warm or room temperature and go great with a glass of wine or whatever cocktail you might be serving. Ever have a disaster in the kitchen? Do share! What a difference some flour makes, right?! Check back tomorrow when I'll be sharing these wonderful coconut rum cookies with rum glaze for Creative Cookie Exchange. Chicken and dumplings mean different dishes depending on where they originate. 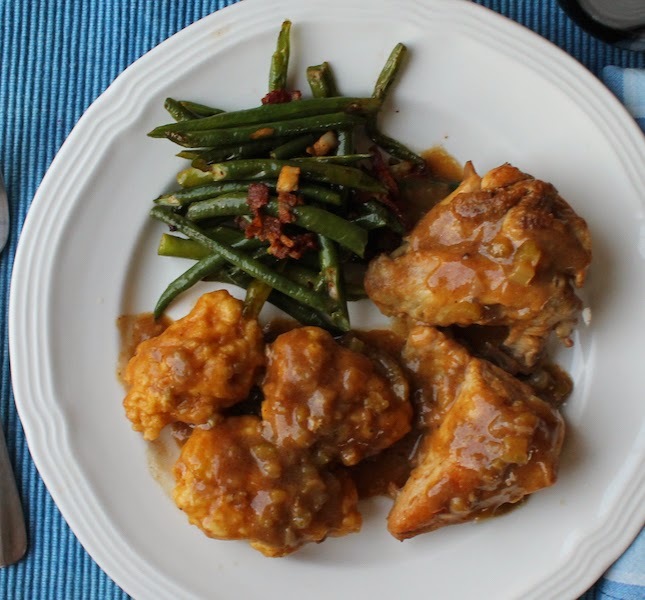 In southern Louisiana, it’s fluffy drop dumplings, cooked in a roux-based simmering rich brown gravy with stewed chicken, just like my grandmother used to make. When one lives in a place where bargaining is standard practice, there is a hierarchy of pricing guidelines and most folks assume I’m a tourist. So, when I am out and about in a local market and someone asks, “Where are you from?” I always answer, “I live here.” And then, if I am truly interested in buying the thing, I start chatting with the vendor. 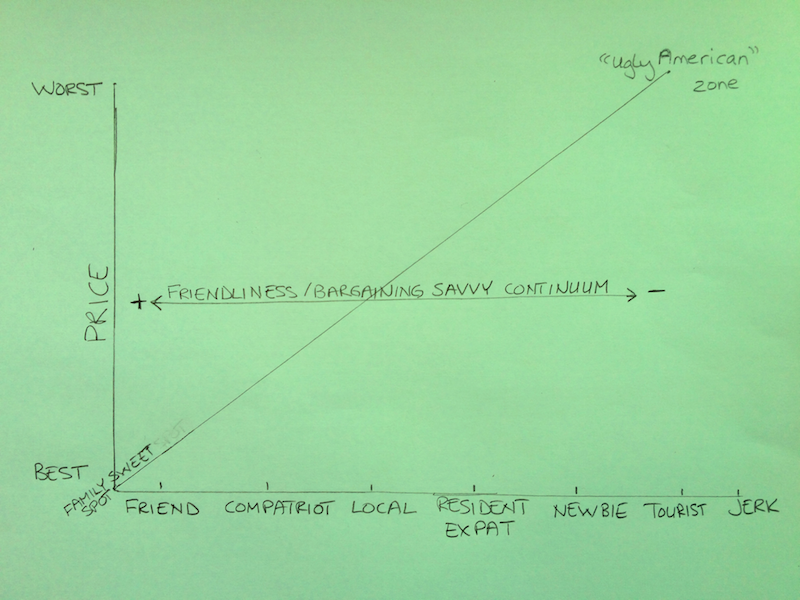 “I live here” puts me squarely in Resident Expat sector, which usually gets me a decent price but not as low as it could be if I cajole my way up the Friendliness/Bargaining Savvy Continuum. If you know what I mean. Here, I’ve drawn you a handy chart. Sadly, I've met folks from a few countries who could qualify as "ugly Americans." It’s only when someone pushes further, that I might say that I am from the United States. If you prod even more, you’ll get “The South.” We have to be having a real conversation for me to get into, “Well, I was born in Louisiana but I lived more years in Texas, but Louisiana is still kind of home because that’s where my grandparents were. Actually, I’ve lived overseas even more years than I have lived in the US.” Whew. 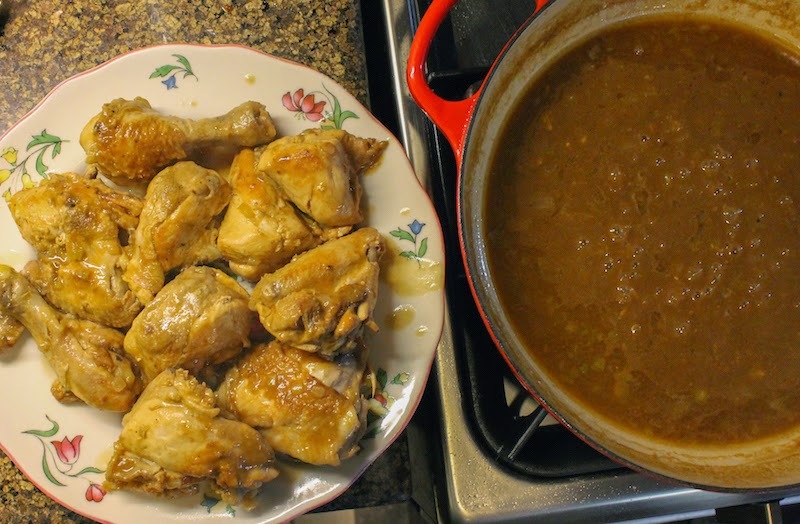 But when it comes to cooking, the first hometown favorites that come to mind are my grandmothers’ traditional Cajun dishes, like chicken and sausage gumbo, courtbouillion, maque choux, smothered pork chops, smothered cabbage with pork, eggplant casserole with shrimp or crawfish etouffee, just to name a few. 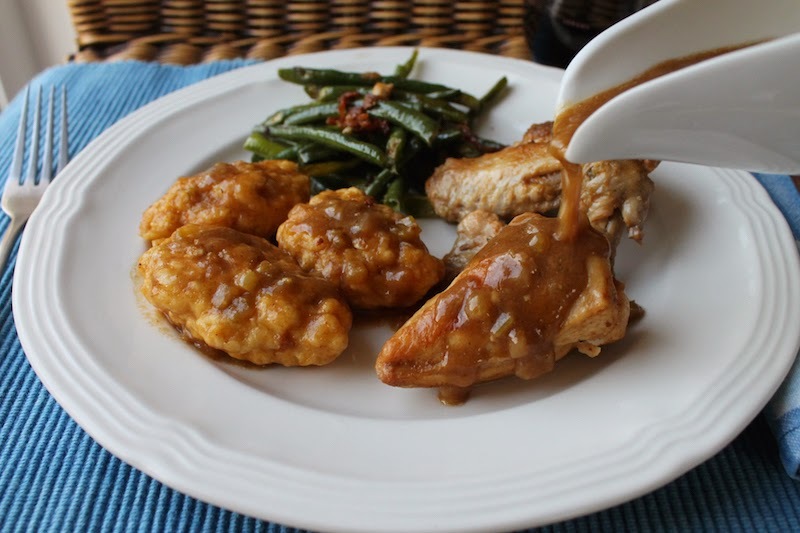 I’ve shared all of those already, as you can tell by the links, so I was wracking my brain for another of my grandmothers’ dishes that I haven’t shared for this week’s Sunday Supper hometown favorites theme. Perhaps smothered round steak or cabbage rolls or crawfish fettuccine casserole? And then it hit me! Note: My grandmother would have undoubtably finished this dinner with a sprinkling of chopped parsley. I plumb forgot. 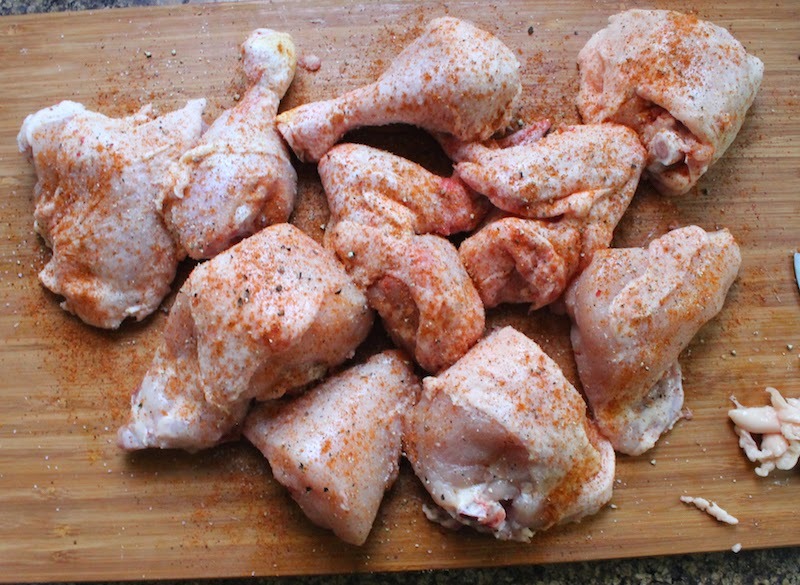 Cut your chicken up into at least eight pieces and season liberally with salt, black pepper and cayenne. If the breasts are large, I cut them in half again to get 10 pieces. I go pretty heavy on the cayenne because we like things spicy but use your best judgment for your family’s tastes. 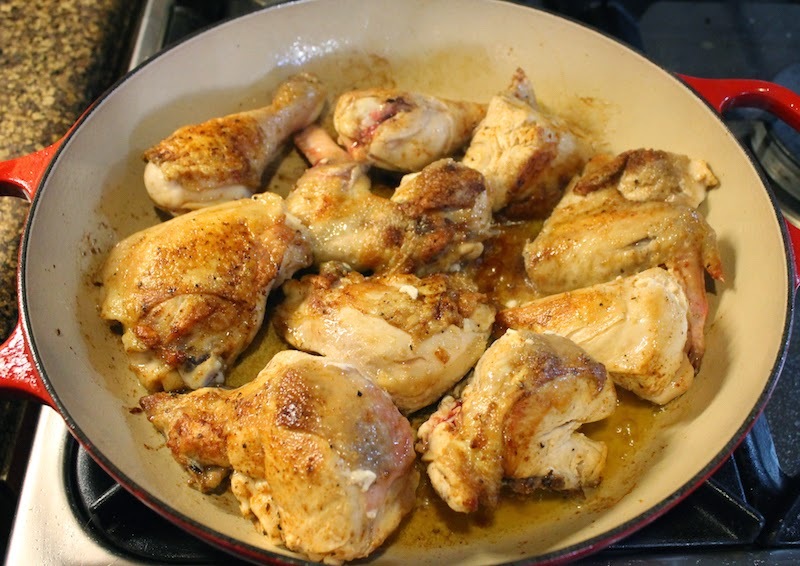 Heat a good drizzle of olive oil in a frying pan and panfry the chicken until it is golden on both sides. 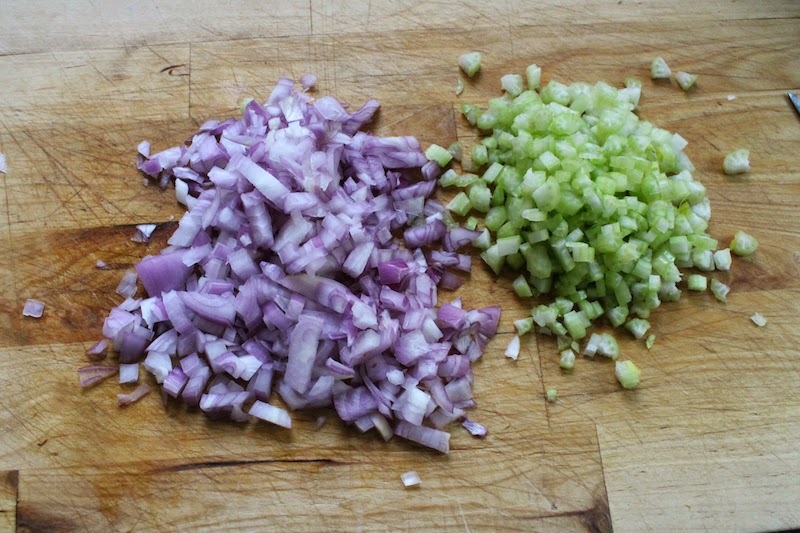 While the chicken is browning, dice your onion and celery. 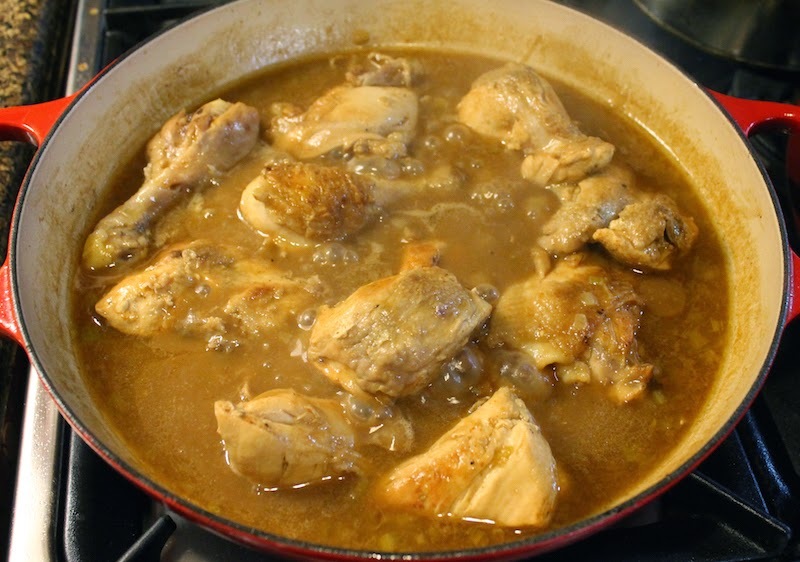 Once the chicken is browned, remove it from the pan and set aside. Add the four tablespoons of flour into the pan and stir until it is completely combined with the oil in the pan. Use a wooden spoon to loosen all the lovely browned bits that are stuck to the pan. 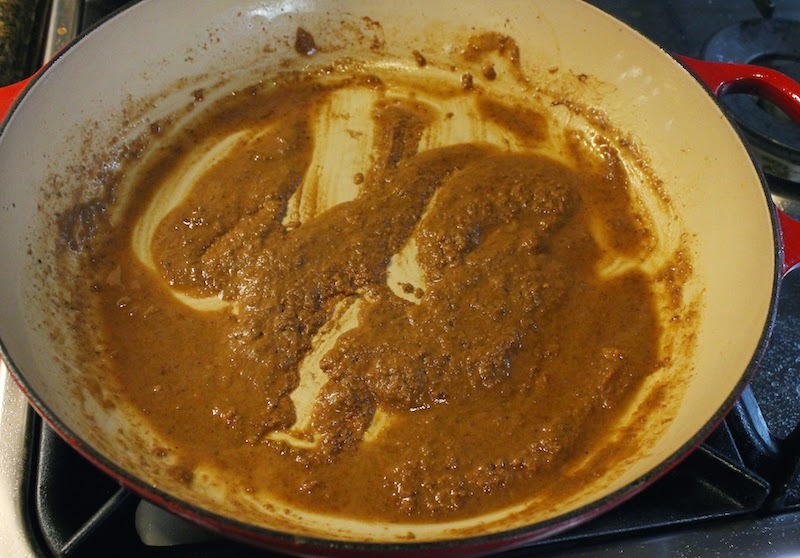 Cook the flour/oil mixture, formally known as a roux, over a medium heat, stirring almost constant, until it reaches a lovely dark copper color. Make sure not to let it catch and scorch or your gravy will taste burnt. 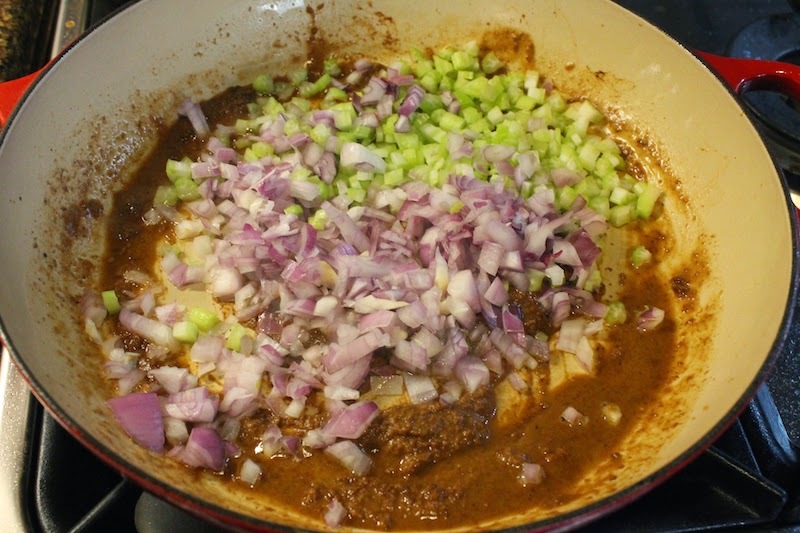 Add in the chopped onion and celery and continue cooking for several minutes until they soften. Slowly add in a couple of cups of water and stir. 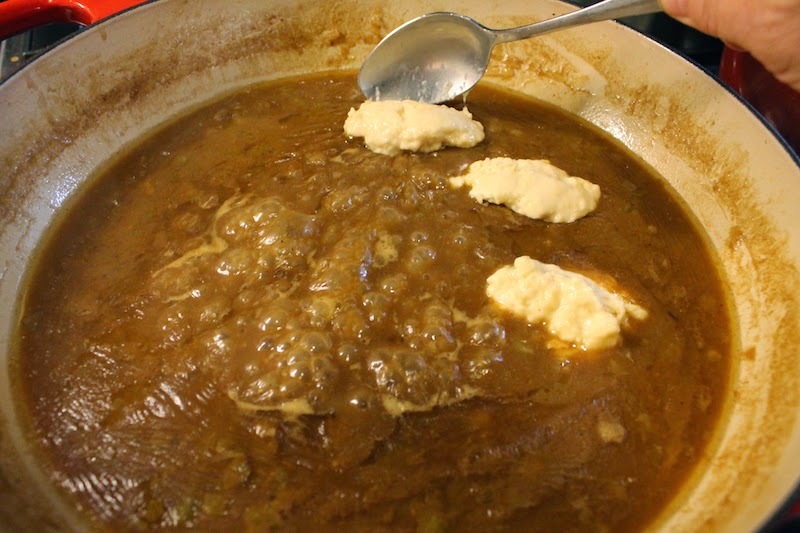 Keep stirring until you have a lovely brown gravy without lumps of flour. 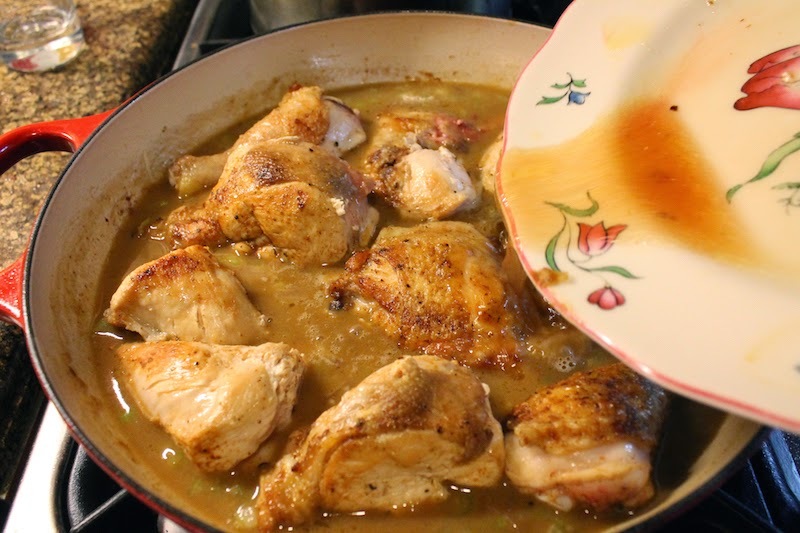 Add the browned chicken back into the pot, along with any juice that is in the plate it was resting on. 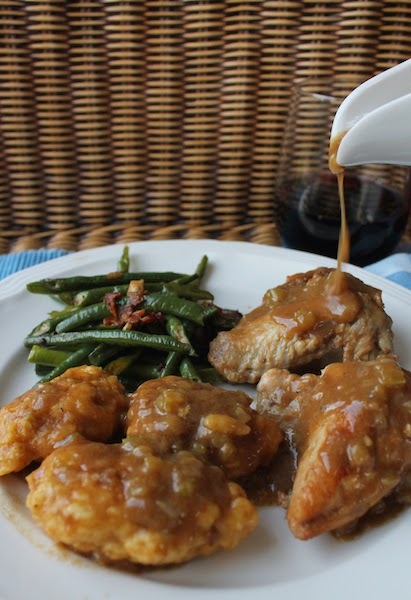 The gravy should come most of the way up the sides of the chicken. Add a little more water, if necessary. Cover the pan and turn the fire down to simmer. Leave to simmer for about 45-55 minutes, checking occasionally that the water doesn’t completely evaporate and adding more if necessary. About halfway through the cooking time, turn the chicken over. When the chicken is tender and cooked through, lightly whisk your egg with your milk and then combine your dumpling ingredients in a mixing bowl, stirring until just mixed. Remove your chicken from the pan and set aside. Cover it so it stays warm. 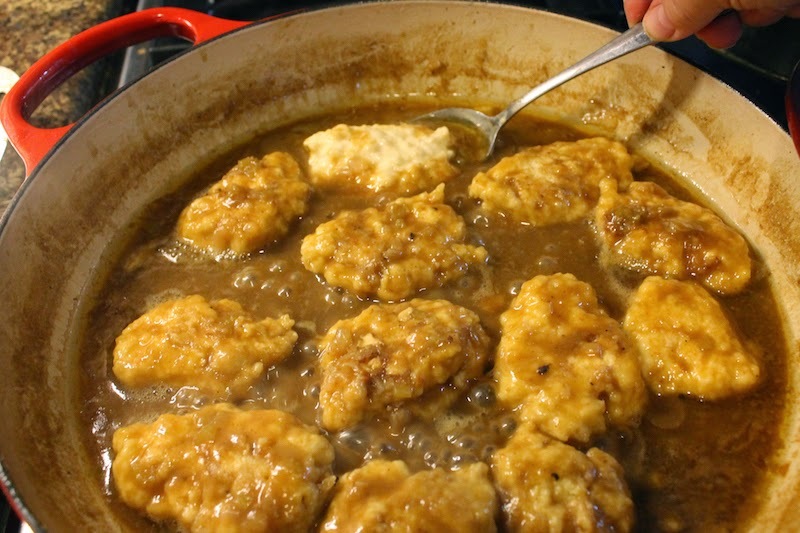 Use a tablespoon to spoon the dumpling batter into the simmering gravy, leaving room between the dumplings so they can puff up as they cook. 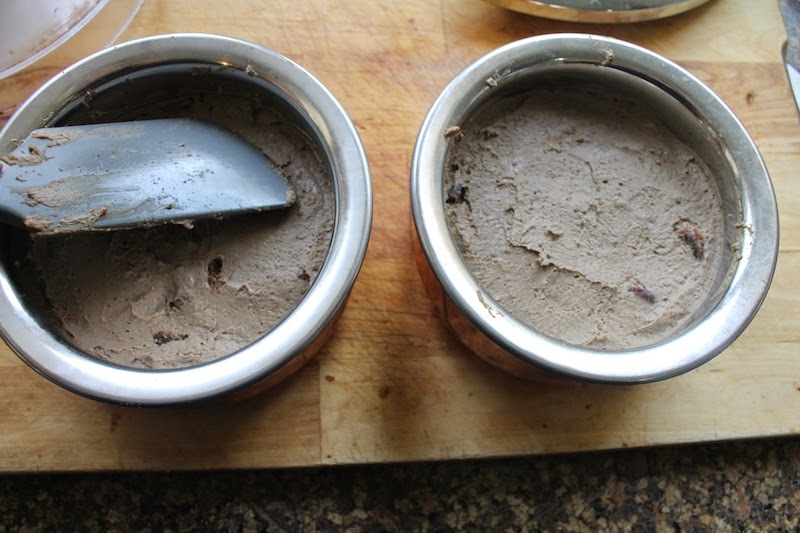 The batter comes off the spoon more easily if the spoon is wet so rinse it with water first and between scoops. Put the lid on for a few minutes. Remove the lid and turn the dumplings over and replace the lid for another minute or two. Transfer the dumplings to a plate and keep them warm until ready to serve, while you cook the remaining dumplings. They will soak up some of the gravy so you can add in a little water and stir well between the two batches if you need to. 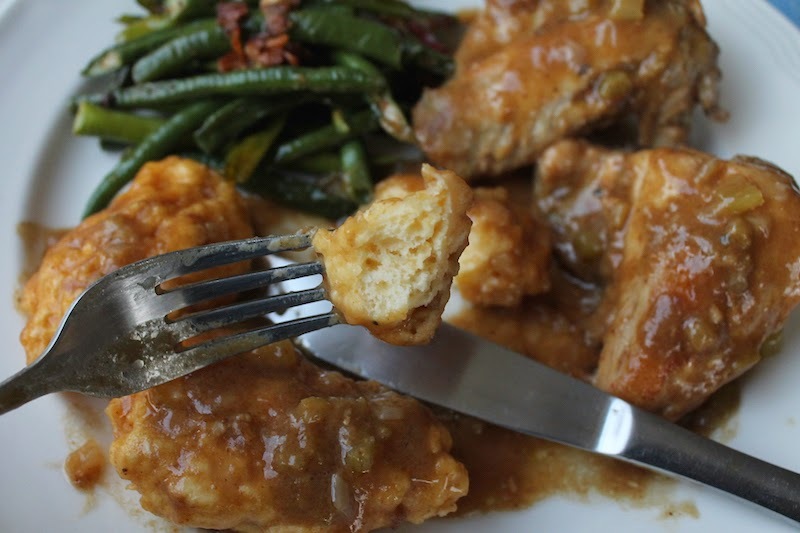 Serve the chicken and dumplings with the remaining gravy from the pan. And my grandmother would always have had a vegetable or two alongside. I am so excited about this week’s Sunday Supper because I know I am going to learn about dishes from so many different places around the US and the world through the loving, perhaps even a bit nostalgic, eyes of my fellow Sunday Supper colleagues and our wonderful host Coleen of The Redhead Baker. What a fabulous list, don’t you agree? !